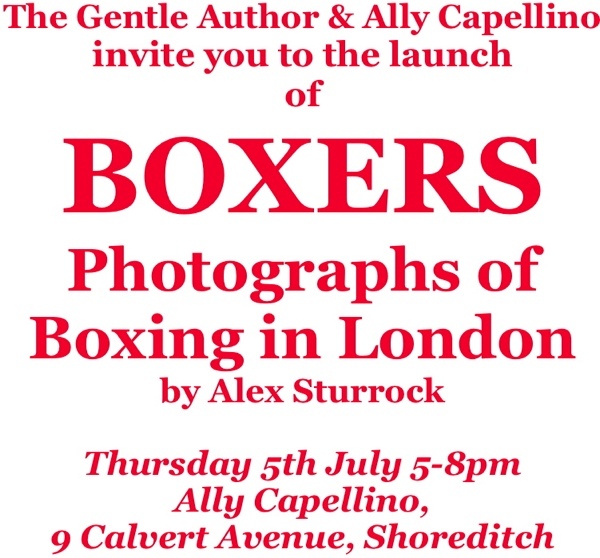 It has been my pleasure to contribute a series of interviews to BOXERS, Photographs of Boxing in London by Alex Sturrock , a large format colour book published next week by Ally Capellino. Here is my interview from the book with Lightweight Champion Ron Cooper, an East Ender who competed in the London Olympics of 1948. 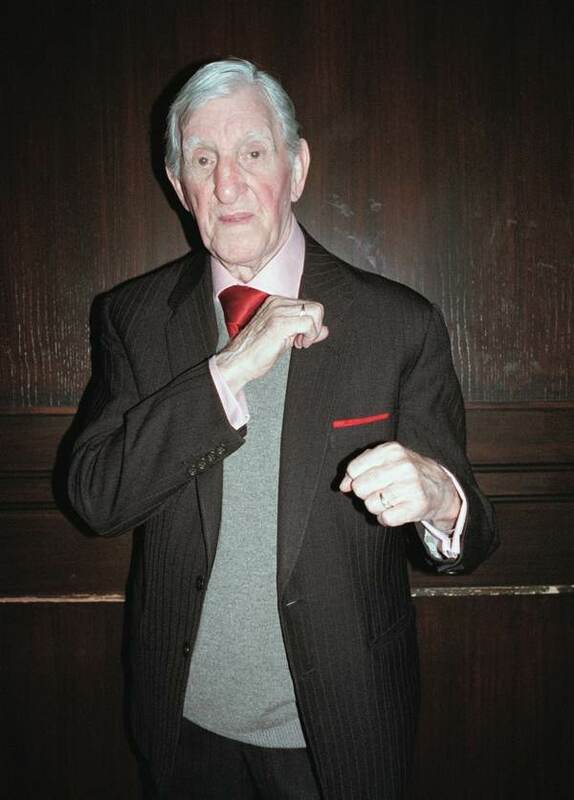 I met Ron Cooper at one of the London Ex-Boxers Association reunions, held each first Sunday morning of the month at the William Blake in Old Street. At these events, you encounter hundreds of ex-boxers enjoying the camaraderie that distinguishes their sport. Every gathering begins with the reading of a list of those who have passed away since last time, followed by a moment of respectful silence, and then it is on to club notices. Speeches and a raffle punctuate the morning and everyone takes comfort in the knowledge that due procedure has been followed in this familiar ritual. Yet, in effect, it is a Sunday service of devotion for all those who love boxing and have devoted their lives to it. And, even though the bar does not open, the sentiment of the occasion is enough to create widespread intoxication. Some of the most senior are the most playful, while handshakes, unselfconscious embraces and posing for yet another group photo, bear witness to the emotion of the moment, recognising that the ties of friendship formed a lifetime ago remain as strong as ever. Amongst the old timers, all suited and booted, shaven and shorn and well-turned out in dark suits, the youngsters are eager to seek inspiration from their idols. And it was in this environment that I had the privilege to sit down in a quiet corner with East End boxing legend, Ron Cooper, while he told me his story in his own words. “I was just a little cockney boy from Limehouse. I felt so proud to fight in the Olympics in London in 1948, all the buttons on my shirt busted! I still have the vest, it’s sixty-two years old and I’d probably get in it now if I done a little training. I was working down in Millwall in the docks, doing welding after I come out the Navy. And when my father died in 1948, soon after I won the ABA lightweight championship, I didn’t want to box anymore, I’d lost all heart. In my first fight after his death, I kept looking around for the old man at the ringside, like he always was. And he wasn’t there. Then my guvnor said, “You’ve been picked, Ron, for the Olympics.” I said, “Yes guvnor, I’ve been picked for the Olympics.” He said, “Where are you going to train?” I said, “I can’t afford to go away. I’m the breadwinner indoors, I’ve got to go to work.” I was the youngest of ten. But my guvnor was a boxing fan, so the first thing he did – I can see it as if it was yesterday – he said, “Mary, get Ronnie three weeks wages. Here’s your wages Ronnie!” And I went away with the British boxing team to Wargrave. I can remember going to Switzerland to box for Britain in 1947 and they put a steak in front of me and I said, “What’s that? Is that a steak? I haven’t seen one of them in six years.” We was on rations. We was getting two ounces of bacon, two ounces of sugar, half a loaf of bread and a bottle of milk per person. That’s how we lived. We were starving. We had nothing. Actually, to tell you the truth, I don’t know how we done it. We were skint, weren’t we, in 1948? Food rationing ‘til when? 1954! This was three years after the war. Bomb damage everywhere. To wear that Olympic blazer with Great Britain on it, that’s the pinnacle of amateur boxing. And you feel proud with the old beret on, little twenty-year-old walking down, still wiping your nose. I boxed at Wembley, I boxed the Dutch champion, Jan Remie, and I beat him. He was like a bull. He wouldn’t leave me alone. He went jab, jab, jab and I went bang, bang, bang. I got put down in the first round but they told me I had him down in the second round and the third round. They told me, “What a fight! What a fight!” I told them, “I didn’t feel a thing. I don’t remember going in, I don’t remember coming out. I don’t remember it.” They told me, “You’ve lost on points but what a fight you’ve had.” I had a lovely letter from the RSBA telling me what a fantastic fight it was. I’d never got knocked out, only when I got married. 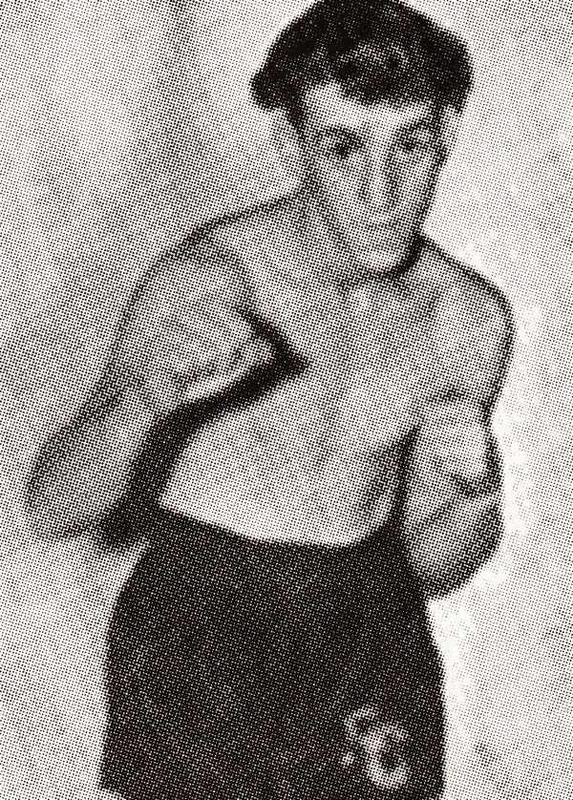 Ron Cooper when he competed in the London Olympics 1948. 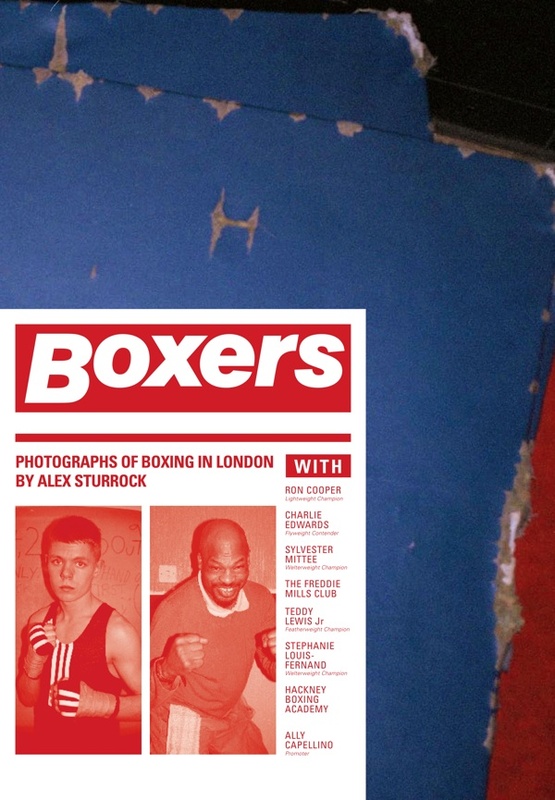 Copies of BOXERS are available from Ally Capellino and Rough Trade in east and west London. i hope you will pardon me for introducing a subject that is off topic. I recently acquired a copy of this 1984 (ca.?) book. it is marvelously well written and full of layers, the way the london is you so often write about. the first chapter is about the use of the tubes as bomb shelters during ww2. it was strictly forbidden, unless you were a passenger — so everyone bought tickets. the heavily bombed east enders liberated two huge commercial underground spaces — “Tilbury”under Commercial Road and Cable Street, and “Mickey’s Shelter” under Stepney. mickey davies was a three-foot-tall hunchback who supervised his space, was replaced by a government-appointed shelter marshal, and by popular demand of the shelterers reinstated. the mass observation documents recording conditions at tilbury are quoted — these docs of sept 14 1940 now at an archives at the university of sussex. self government was an enormous feature and was well established by the time the government tried to regulate the spsaces. under the savoy hotel a replica of the titanic ballroom was built as a posh bomb shelter chronicled by cecil beaton. into it the communist MP phil piratin led 100 east enders who could not by law be excluded. they left after the raid, remembering to tip the staff. i don’t know if there are other sources on Mickey Davies and the shelterers. but this was wonderful. here is davies (back to camera) leading a shelterers’ meeting. Those who fancy more of the same, but older and American, might want to try Peter Heller: In This Corner (1973) (http://amzn.to/KOe61Y) . Forty world champions from 1910s onwards reminisce. Ron is still going strong he married my second cousin Bessie ,Ron as just had a hip replacement. 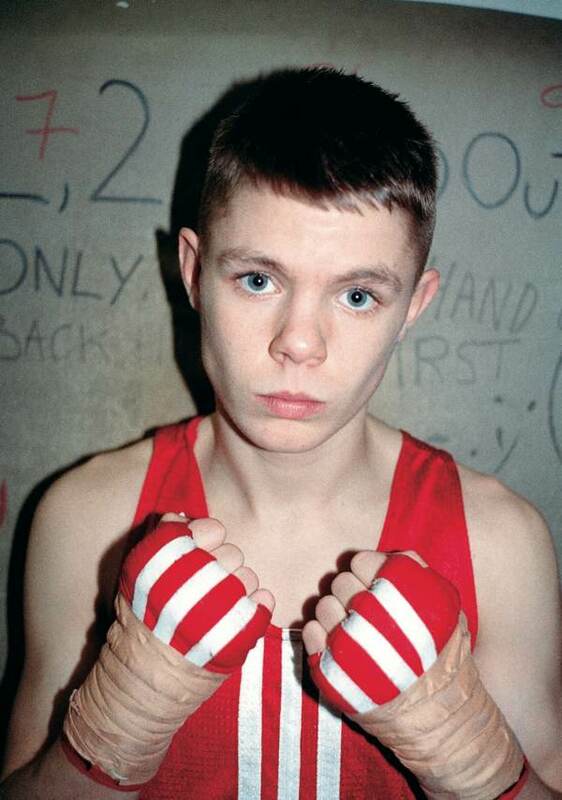 I am doing an art project on the history of east end boxing. i am studying illustration and would love to meet, talk to and draw ron copper. if anyone would be able to help me make contact with him or any of the other interesting characters from east ends boxing history i would be very grateful.